Lausanne – June 13, 2018. À BLOC today officially announces a partnership with Swiss craft brewery Brasserie du Jorat to launch its craft beer in Switzerland. Brasserie du Jorat is a well-established craft brewer in the vicinity of Lausanne, the Olympic capital since 1994, and host city of many international sports federations. Swiss made À BLOC beer is available within Switzerland as of June 15, 2018, coinciding with the Tour de Suisse, where many of the worlds top cyclists and teams will compete including Geneva-based Team KATUSHA ALPECIN, of which À BLOC is an official partner. 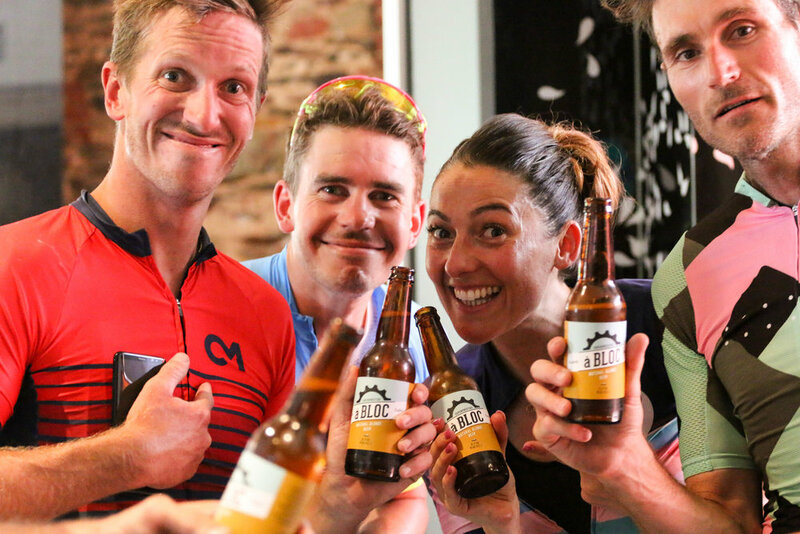 Born out of a passion for cycling and quality beer, À BLOC combines two of its founders’ favourite worlds: cycling and craft beer. The recipes are designed to be the most refreshing and crisp post-ride beers available, with added Alpine Minerals for better rehydration. Brasserie du Jorat will be brewing, in Switzerland, À BLOC Natural Blonde Beer, an unfiltered refreshing beer containing elements of a Hefeweizen wheat beer and pilsner (4.9% Alc); and the new Ultralight IPA, a real IPA but with only 1.2% alcohol and ultra low in calories, yet full in flavour. Brasserie du Jorat was founded in 2006 by Raoul Gendroz, and was recently taken over by Henri Jung and Alexandre Clerc, with a long-term vision to grow the business with Raoul’s team, bringing Brasserie du Jorat to the next level. Henri and Alexandre started their collaboration in 1999 at Kronenbourg Switzerland, where they successfully brought various Kronenbourg brands to the Swiss market. Later on they also worked together for Carlsberg Switzerland. Henri Jung, 54, has a rich and varied career in marketing and management. Alexandre Clerc, 46, brings not only finance and business administration skills, but also an extensive knowledge of the Swiss beer market. Daan van Well, founder and CEO of À BLOC: "Switzerland sets the ideal scene for À BLOC. Sports and active outdoor life are an integral part of the Swiss culture, and every year many tourists come to visit the Swiss alps, both in summer and in winter. We are extremely pleased to be partnering with Henri and Alexandre and their skilled team of Brasserie du Jorat. They provide a wealth of experience in the Swiss beer market, and a genuine passion for quality craft beer and we are proud to be brewing À BLOC in Switzerland with the team of brasserie du Jorat." After the Netherlands, Australia, South Africa, the UK and Denmark, the Swiss market will be the sixth country where À BLOC is distributed. À BLOC is currently brewed by 5 craft breweries on 3 different continents (Europe, Australia, and Africa), all according to the same recipe and with added Alpine Minerals.